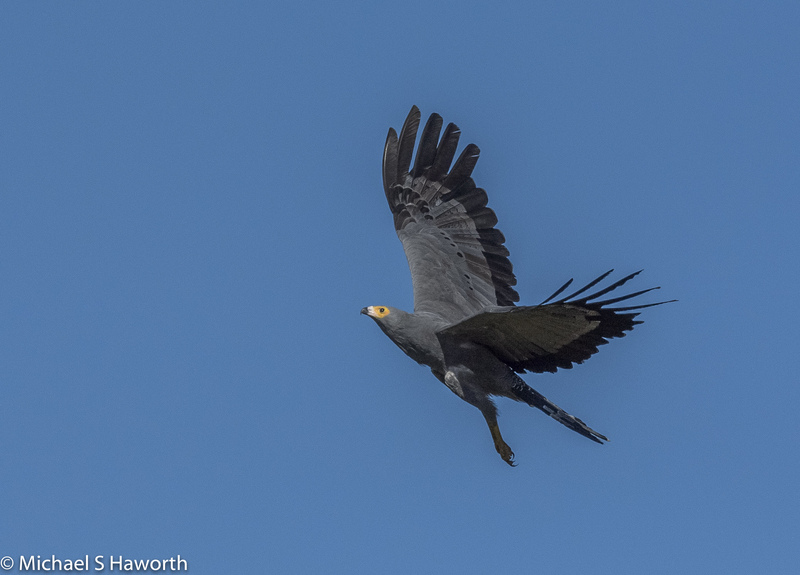 The African Harrier Hawk has always intrigued me because it is such an unusual raptor, though I do prefer its previous more exotic name, Gymnogene,which means bare cheeks. It has the legs of a harrier and flies like a hawk. Although not threatened, you will not often see this species but it is a thrill when you do because it is such an impressive raptor. It has distinctive colouring, is relatively large and has some unique behavioural traits. Generally, hawks kill their prey with their claws, unlike the falcons, which catch prey with the claws but kill with a blow of their beak. Hawks are unusual among birds in that the female is generally larger than her mate. In some species, this difference, called sexual dimorphism, can be as great with the female being much larger than the males, as in the accipiters. This is particularly evident in Fish Eagles. Hawks generally mate for life, and are agressively territorial. Harriers are plain-looking, long-legged, and long-tailed birds with a slender build which enables them to cruise low over grasslands and marshes looking for prey. Harriers usually have small beaks, and their face feathers are arranged in facial discs. 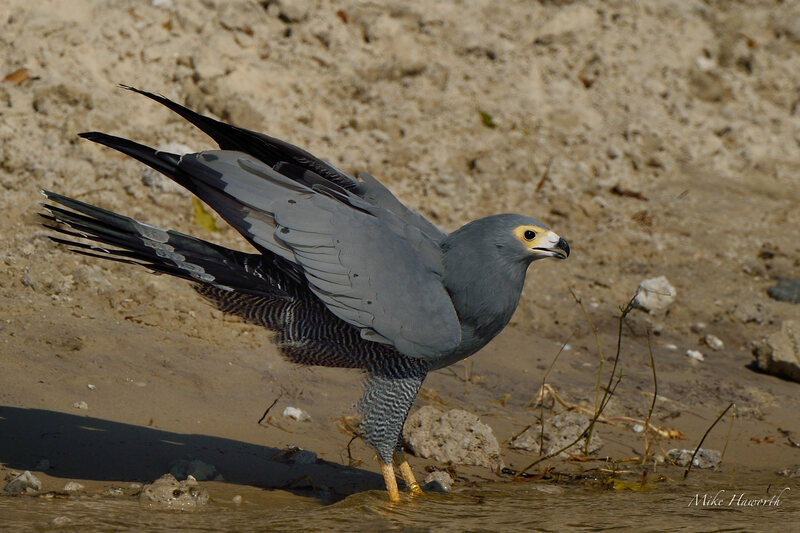 The African Harrier Hawk has a clear a mix of both harrier and hawk characteristics, hence its name. This is a medium to large raptor. It can grow to around 63cm in length with a wing span of 160cm and can weigh up to 950 grams. 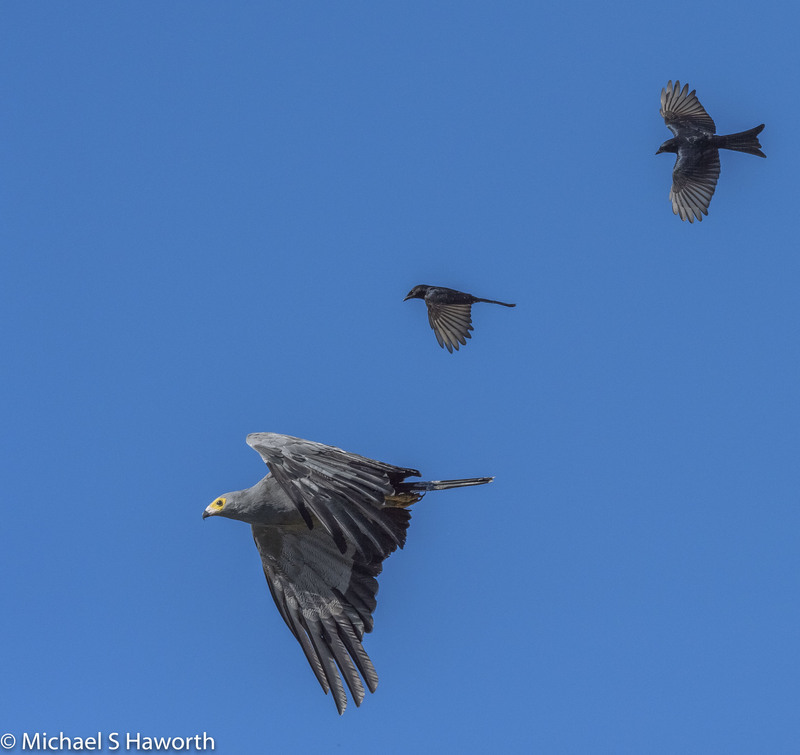 There is little colour dimorphism between male and female but as with hawks, the female is larger. 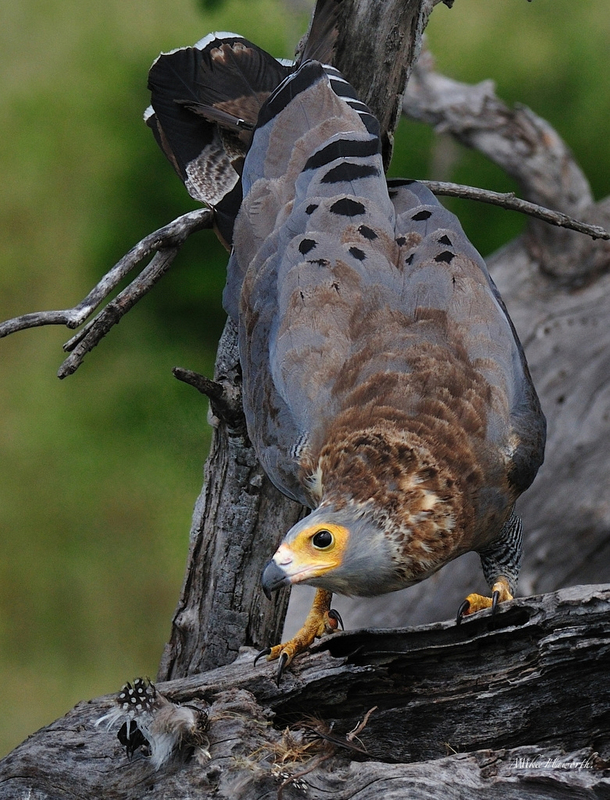 African Harrier Hawks are recognised by other birds as nest raiders. When seen in the area, other birds become very vocal warning each other of an impending invasion. 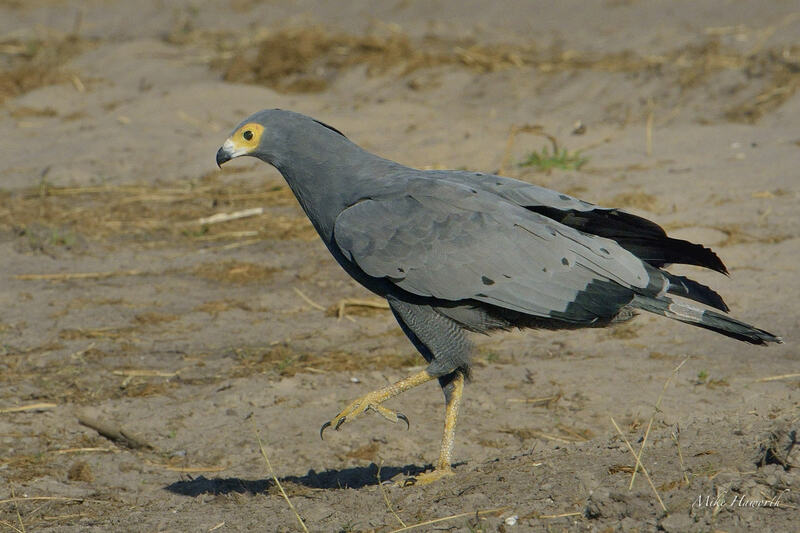 The African Harrier-Hawk is omnivorous, eating anything its can find from fruit to small birds and mammals, reptiles and insects. 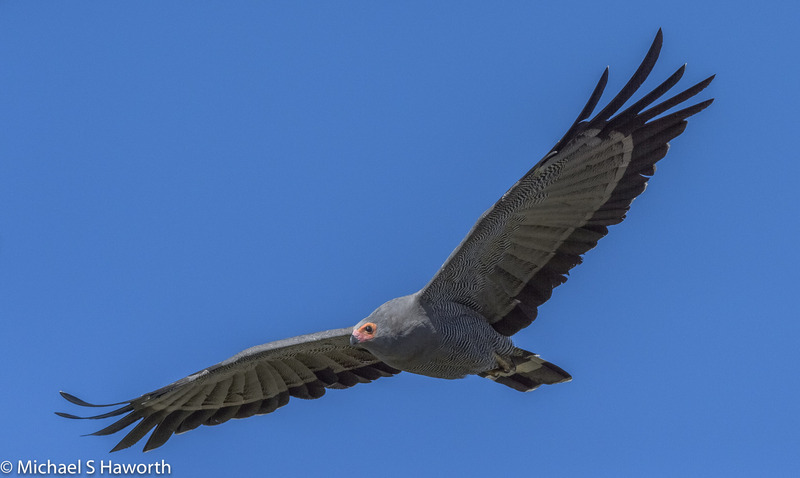 Its ability to climb, using wings as well as feet, and its long double-jointed legs, enable this bird to raid the nests of cavity-nesters such as barbets, oxpeckers, squirrels and woodhoopoes for eggs and fledglings. This raptor is notable for its habit of actively searching for prey in trees, nests, rock faces, and from underneath objects on the ground. It can often be seen clambering about and hanging from tree limbs, running up tree trunks with wings flapping, or hanging from birds nests as it searches for food. Its featherless legs facilitate this behaviour. The plumage is mainly grey, with neat light black and white barring on the abdomen and thighs, but is sometimes absent in individuals. 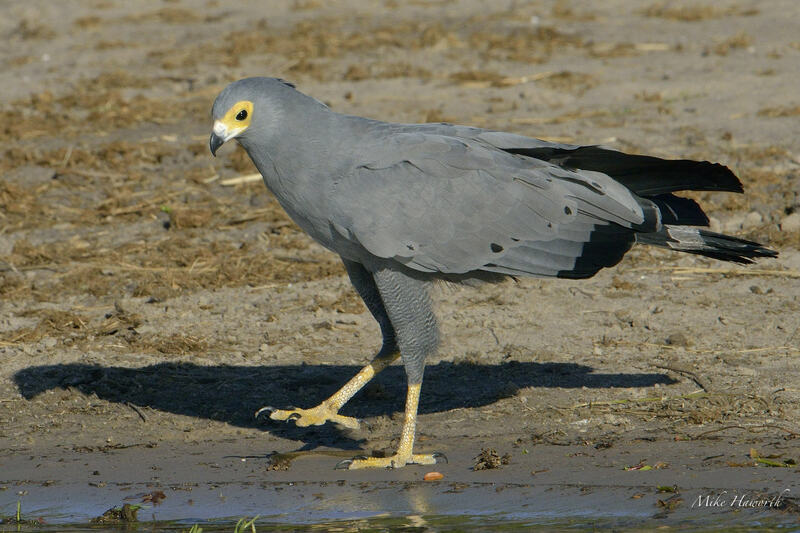 The African Harrier Hawk has a bare facial patch, which is varies in colour, but is usually seen as bright yellow. This facial patch becomes pink during display, and various shades of orange between yellow and red according to its emotional state. This particular character was wandering along the bank of the Chobe river looking for a spot to drink. No doubt these raptors are also very wary of the danger lurking below the surface of the water. The relatively low aspect ratio of the wing allows this raptor to fly surprisingly slowly and deliberately, for such as large raptor, when hunting. A low aspect ratio wing has relatively low ratio of wing length to wing width. Generally, high aspect ratio wings give more lift and enable sustained, endurance flight, while low aspect ratio wings are best for swift maneuverability. 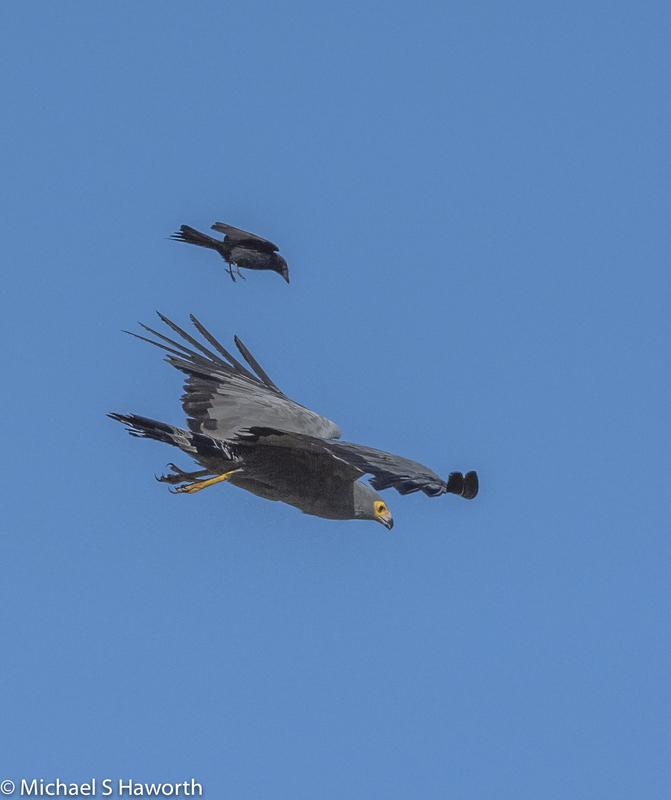 The male and female African Harrier-hawks are similar in appearance, while juveniles have brown plumage, blackish facial skin, a brown tail with four darker brown bars, and variable amounts of whitish, reddish-brown or dark bars or streaks on the abdomen. Adult plumage is not attained until about the third year. This particular character was raiding birds nests in a dead tree trunk. What makes it so unusual is its adaptive flexible knee-joints, being double jointed, enables it to put its feet into hard to get at places. It can probes crevices and hollows for lizards and larvae. It will hang upside down on hanging bird nests to rob their eggs and chicks. You will often see this raptor walking along branches and up tree trunks, with wings widespread to stabilize it. The previous image was of a relative young bird just before its adult moult. We came across this bird one afternoon on the Chobe River. It was busy pillaging a bird’s nest and pulling out the oxpecker chicks one by one and eating them. These raptors although relatively large, with lethal armaments, do not get things all their own way. The birds which usually nest in the surrounding trees can get quite aggressive and persistent. 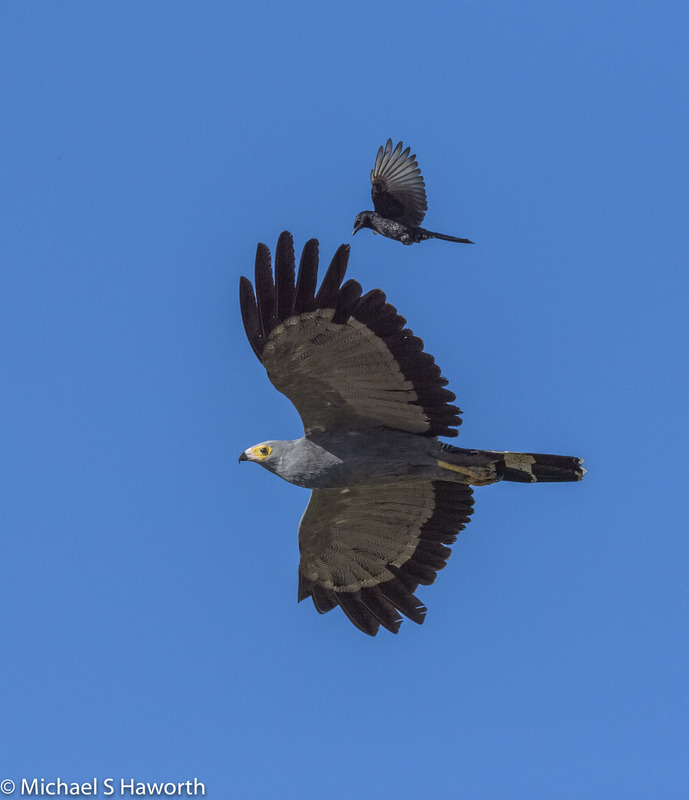 The next image is of a Fork-tailed Drongo giving this harrier Hawk a “rev”. At times these small attackers land on the flying host and peck at it. 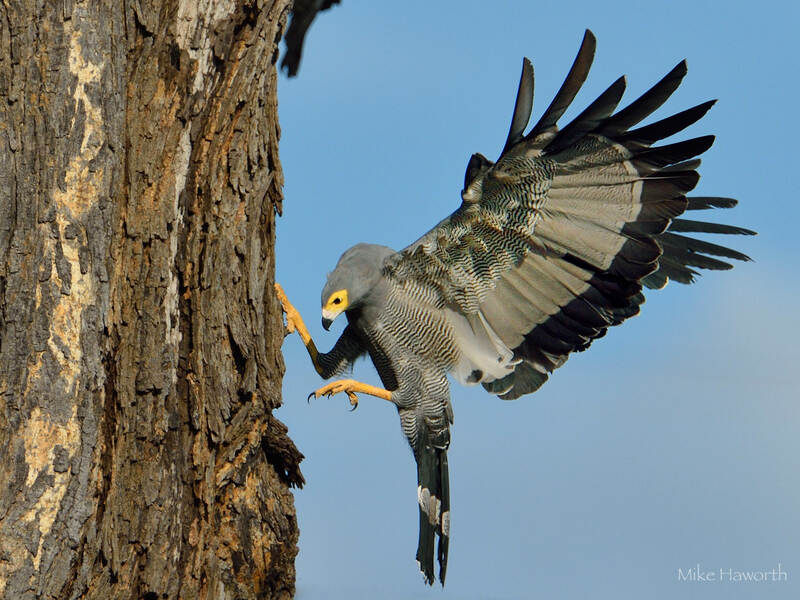 The African Harrier Hawk is an agile flier, capable of soaring in thermals but also mixing it up in woodland savanna and being able, like a Sparrowhawk, to negotiate its way through trees and branches. It is also an excellent tree climber. Fork-tailed Drongos, rollers, lapwings all give these raptors a good going over whenever possible and obviously always on the wing. 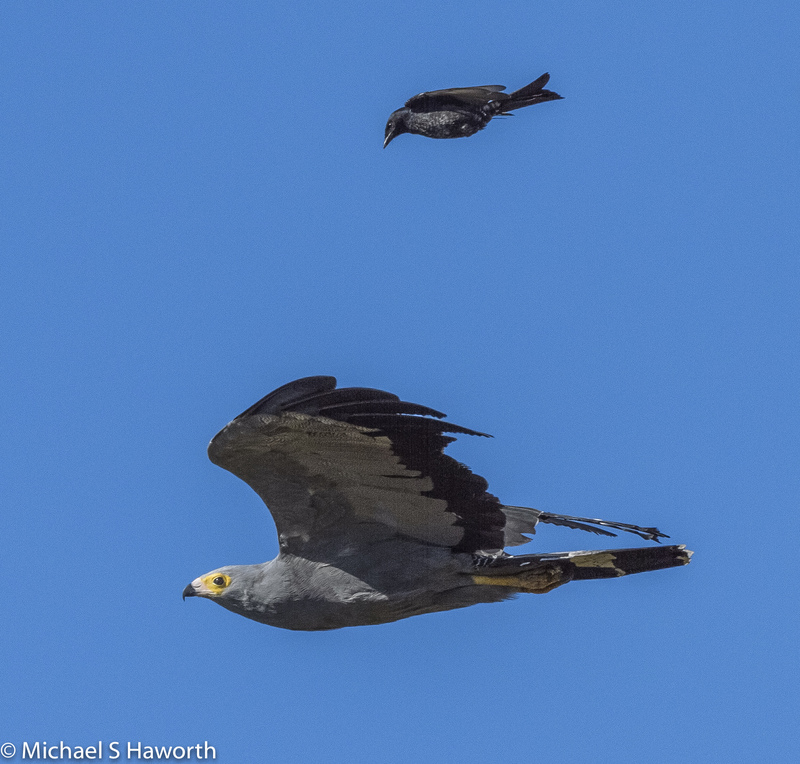 The next image shows a African Harrier Hawk gliding along the river bank with its primary feather testing the wind like fingers. Its pinkish facial skin is signalling its relative state of excitement. This is also seen in Bateleur Eagles which also have yellowish facial skin that changes from yellow to red depending on its level of excitement. 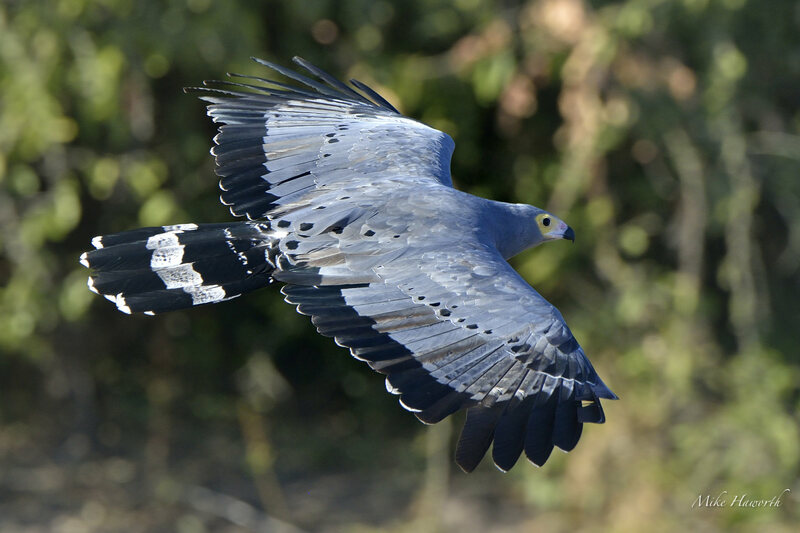 When flying, the underside of the African Harrier-hawk’s wings are grey with a wide black trailing edge. It has a white band across its tail feathers and the trailing edge of those feathers also have a wide black tip. 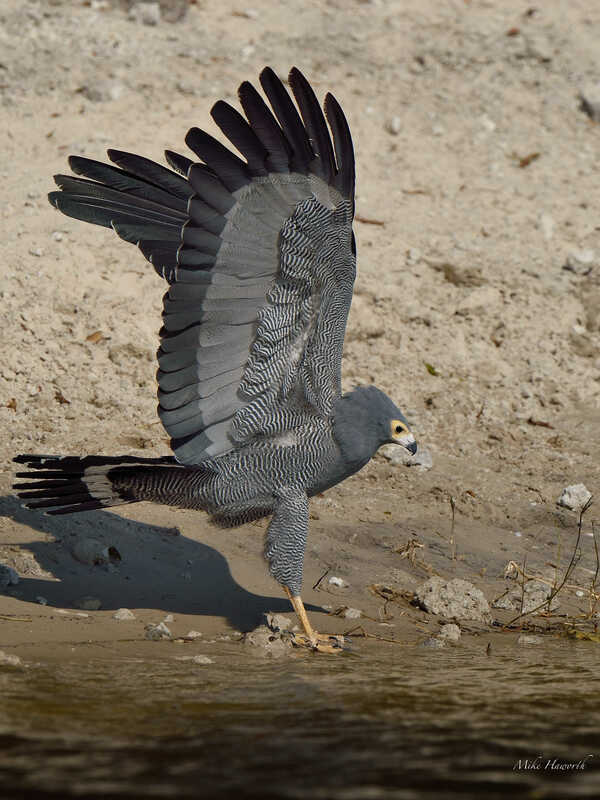 When you see an African Harrier Hawk patrolling the banks of the Chobe river, it is often getting mobbed by smaller birds. This raptor is a major threat to birds which nest in trees and cavities in trees and rocks. When defending their nest and chicks, size seems to be less important. 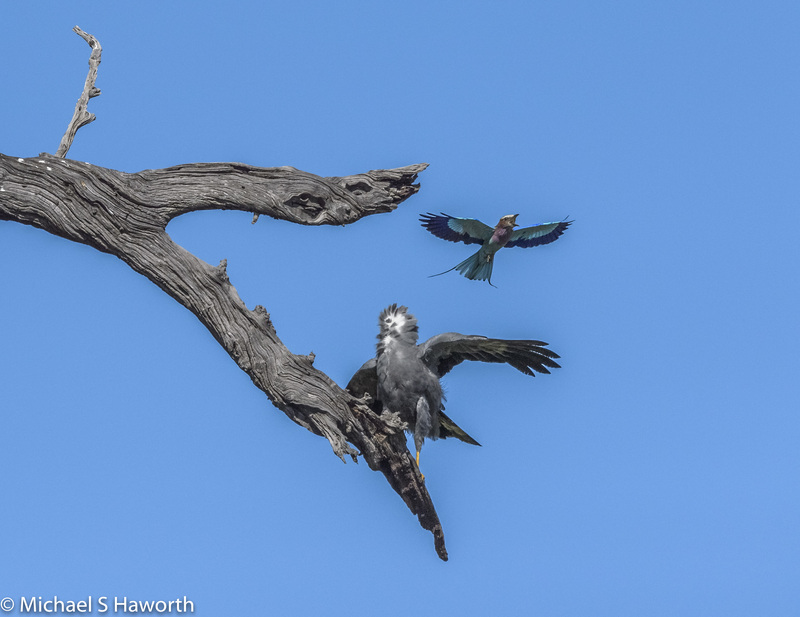 Small birds like Fork-tailed Drongos will fly up and dive bomb the raptor often hitting it on the back or wing. 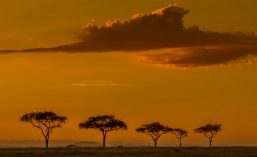 They will undertake remarkably daring attacks to drive this threat away from their nesting sites. The defensive attacks are usually from the back as the front end is considerably more dangerous. The defensive antics of these smaller nesters can be dramatic to watch employing fearless manoeuvres in their quest to drive the potential raider out of the area. If the threat is severe enough both members of the protection squad will join in the harassing process. 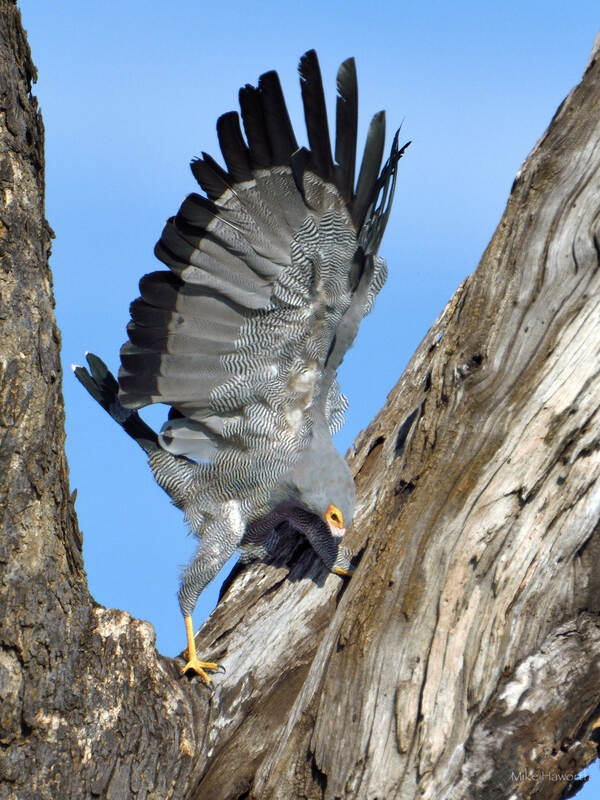 Although the African Harrier-hawk is lethally armed, in nature it is seldom a one way street. Your pictures are superb – as always! I still refer to these birds as Gymnogenes for I think the name is most appropriate. We are fortunate to have a pair of them which nest in our town. A couple of weeks ago one was being attacked vigorously by fork-tailed drongos and weavers and sought refuge in the large Erythrina tree in our back yard. It was there for about half an hour before moving off effortlessly. What a thrill this encounter must have been for you! Thanks Anne – nature is more weird and wonderful than we could ever dream up!